The source of these unusual colours in Thoroughbreds is always the dilution gene called cream, since other dilution colours such as dun, champagne, pearl and silver dapple are not found in Thoroughbreds. Here are the basics of cream. First, every Palomino and every buckskin must have one parent that carries the cream gene. A Palomino is a chestnut that has inherited a cream gene from one parent, lightening the mane and tail to white and the body to gold. If it inherits a cream gene from each parent, it will be cremello, which looks ivory white. A buckskin is a bay horse that has inherited one cream gene, which changes the body colour to gold, but leaves the legs, mane and tail black. If it inherits two cream genes, it will be perlino, in which the body coat becomes ivory white and the legs, mane and tail are diluted to tan or orange. Cremellos and perlinos always have blue eyes and pink skin. A cremello or a perlino (in other words, a double cream) will always produce foals of a diluted colour, no matter what colour horse it is bred to. Double cream to chestnut = guaranteed Palomino. Double cream to bay = guaranteed buckskin. Double cream to double cream = double cream. But just to throw a twist into the occasion, black behaves differently. A black with one cream gene looks black, since a single cream gene will not affect the appearance of black, just as a buckskin horse still has a black mane, tail and legs. But it is really a smoky black and can still pass on the cream gene. Without DNA testing, often the only indication that a black horse is smoky black is if it produces a Palomino, buckskin or double cream foal. A black horse with two cream genes is called smoky cream, and will be any shade of cream from cafe au lait to cream with brownish, yellowish, smoky blue or sooty legs, mane and tail, sometimes darker than a perlino but with the usual blue eyes and pink skin. Black itself is not a common colour in Thoroughbreds, and the cream gene is not common either, so smoky cream is one of the rarest of all colours in the breed. Arabian horses do not carry the cream gene. There are no buckskin or Palomino Arabians. Those that look like they might be are really light bay or flaxen chestnut. Flaxen is a gene that lighten the mane, tail and legs on a chestnut horse, but it is not Palomino. For the source of the cream gene in Thoroughbreds, you need to go back all the way to the beginnings of the breed. There are a few paintings that reveal the colours of these early race horses. Names can be a clue as well. Usually “gold” meant buckskin and “yellow” meant Palomino, but not always. Some horses were called Palomino but were really buckskin. Horses called “dun” could be buckskin or Palomino. Since cream is not found in Arabians, the gene could only come from native English horses, Turks and Barbs. Turks were the ancestors of what today are called Akhal-Tekes. Dilute genes, along with an unusual metallic gleam to the coat, are common in this breed. Note that “Arabian” did not mean the same thing as it does today. In those days, all eastern horses, whether Turk, Arabian or Barb, were generally named according to where they were purchased or captured in war. Thus, a Turk bought in Syria could be called an Arabian, unless he was previously identified as a Turk. Any “dun” Arabians in the old pedigrees are either Turks, Barbs or Arabians mixed with Turk and/or Barb. 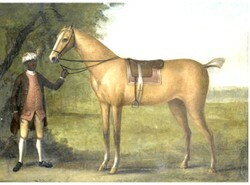 A painting of Darcy's Yellow Turk, born about 1665, depicts a metallic golden buckskin horse. He was imported to England from Syria in 1675 and is found in all modern Thoroughbred pedigrees. Many of his descendants were grey, which they inherited from their dams, and could have carried the cream gene forward for many generations. His son Spanker is listed as bay, but must have been buckskin, since Spanker's granddaughter Cream Cheeks was an early source of cream. Her offspring included the Akaster Turk Mare (Palomino). Cream Cheeks had a Palomino granddaughter Silverlocks, out of Sister of Chanter (colour unknown, but possibly grey carrying cream), and Silverlocks produced a Palomino son named Silvertail (by Middleton Saucebox) plus the buckskin colt Buffcoat and three unnamed buckskin sisters to Buffcoat, all sired by the bay Godolphin Arabian, and two bays by Godolphin Whitefoot. Buffcoat sired a buckskin son called Creampot (1755) and then his line apparently ends. Sister One to Buffcoat produced the buckskin colt Brilliant, a successful stallion. At least sixteen of his offspring were buckskin, and several of them carried the colour on for one more generation, but after that the Brilliant line disappears completely. Sister Two produced the Palomino called Silvertail (a different horse from the first one) and four buckskins: the colts Easby Miller, Ginger and Well-Done and the filly Isabella. Only Isabella bred on, producing three buckskin colts, none of which show any offspring. There apparently are no cream genes coming from Isabella today. Another source of cream was Thwaite's Dun Mare, who produced a mare of unknown colour sired by Crofts Partner. That mare produced a filly (colour unknown) by Crab, who then produced a mare called Golden Locks, registered as chestnut, who produced a chestnut filly named Sportsmistress, who had eight chestnut foals and one bay foal. Sportsmistress only has descendants from one son: the famous chestnut stallion Pot-8-Os (registered as Potoooooooo). A painting of him clearly shows he was indeed chestnut, not Palomino, so this line of cream genes also came to an end, probably with Golden Locks being the last. Other seventeenth and eighteenth century Thoroughbred and imported animals that had or probably had the cream gene included Morgan's Dun (buckskin, no offspring known) and the Gower Dun Barb (buckskin). The Gower Dun sired six foals, all buckskin, but none of them left any known offspring. The Oxford Dun Arabian sired the Oxford Dun Arabian Mare, who was Palomino, but her only foal, Mrs. Slammerkin, was bay and produced only black, grey and bay. And that appears to be the end of a once-common colour in the Thoroughbred. So where did the cream gene go, and why did it suddenly re-emerge more than a century later? Since every dilute-coloured horse must have inherited the gene from one or both parents, how did these colours go unnoticed in Thoroughbreds? One reason is the practice of the Thoroughbred registries themselves. Until very recently, most foals were registered only as black, bay, bay-or-brown, chestnut or grey. Palominos were registered as chestnut, buckskins as bays, and greys were simply registered as grey, no matter what their original foal colour was. As for perlinos and cremellos, possibly the breeders of the time thought they resulted from accidental matings and just gave away or sold them as riding horses. Perhaps they were worth more money when sold as as carriage horses because of the similar colour of the Royal Hanoverian Creams, coach horses brought to England by King George I and very much favoured by George III and IV. Palominos have always been in high demand as riding horses, and might have gone straight into private hands, and, once horse shows became popular, into show barns without ever being registered, because they could sell for more money that way than they would have brought as racing prospects. That would really skew the progeny colour statistics. If a buckskin or Palomino also carried grey, it would always turn grey and be registered as grey. There would be no way to tell from the adult horse's appearance or his registration that he was born buckskin or Palomino. And since every grey horse has at least one grey parent, there could be hidden cream genes that only showed up when a grey horse produced a non-grey, dilute-coloured foal out of a non-dilute mate. Another factor that can disguise cream is a gene called sooty. This is what causes all the shading on a bay horse. Without sooty, the base coat is all one clear shade of brown or red. Sooty in chestnut horses puts dark hair in the mane and tail. A Palomino that also has the sooty gene might range from the usual gold colour with some dark hair in the tail all the way to a dark brown with lighter or darker mane and/or tail, nothing at all like a “traditional” golden Palomino. Sooty on buckskin causes intense shading, sometimes darkening it to what looks like a dusty bay but with a gold tint or even to dark brown. One visual clue about the colour is that chestnut and bay have red or copper highlights, while a horse with a cream gene has golden highlights, but that can be hard to see in a very dark horse carrying cream. Dark buckskins can readily be mistaken for dark bays or even browns, although they often have lighter shading on the face which provides a clue. Only when a dilute foal is produced from such a horse would people realize that it is actually a very dark buckskin. Of course, today's genetic testing can tell what colour the horse really is, but that is a recent development. And cream is always invisible if carried by a black horse. The Irish-bred Marlon, registered as bay, was a very dark buckskin born in 1958. Marlon was by the brown Tamerlane, out of the bay Maralinni, by Fairford. He sired both Palomino and buckskin foals. Marlon is probably not seen in any Thoroughbred pedigrees, but he was very important in the Holsteiner warmblood breeding program. He was at stud in Germany from 1965 until his death in 1981 at age 23, and was one of six foundation stallions used to create the modern Holsteiner sport horse. Marlon may not have sired any stakes winners, but he was an excellent sire of performance horses. His son Madrigal won an individual bronze medal and team silver medal in Eventing at the 1976 Montreal Olympics, and his son Montevideo was a member of the gold medal dressage team at the 1984 Los Angeles Olympics. Although registered as chestnut, the stallion Sylfou was definitely a Palomino. He was born in France in 1959, by Djefou (brown) out of Sylvania (unknown colour). She was by Louqsor (bay) out of Selve (unknown colour again). Sylfou sired three foals of unknown colour plus the Palomino colt Kingo (Denmark, 1966). It is unknown if this dilute-colour bloodline is still in existence. The first of the North American Palominos was Milkie, foaled in 1966, by Deer Lodge (bay) out of Tootsie T (registered as brown). Milkie's sire is unlikely to be the source of the cream gene, since Palominos and buckskins certainly would have been noticed coming from such venerable stallions as Mahmoud, Menow, Bull Lea and Khaled, so that leaves his dam. Tootsie T was by a chestnut (therefore he was not carrying cream, if correctly registered) out of the brown Hekuni, whose dam was brown and whose granddams were black and brown. Could some of these have been smoky black or sooty buckskin? When Milkie's tail-female pedigree is examined, many of the other foals from these mares do not have colours listed, so there is no way to know if other dilute foals were produced. The direct female line back from Tootsie T is all browns and bays back to Honeysuckle (black, 1851). This mare was out of the bay Beeswing, by the brown Dr. Syntax, by the brown Paynator, by the black Trumpator, who was out of the brown Brunette. Brunette's dam was the bay Dove out of the black Starling Mare. That mare was by the grey Ancaster Starling, sired by the grey Bolton Starling (1727), who was by the bay horse Bay Bolton. He was out of the black Makeless Mare, sired by the chestnut (maybe Palomino?) Makeless, by the Oglethorpe Arabian, by Darcy's Yellow Turk. The Makeless Mare's dam was Brimmer Mare, by Brimmer, by Darcy's Yellow Turk. No colours are known for them. If that line of bays, browns and blacks was actually an unbroken line of smoky blacks and sooty buckskins, there is indeed a chance that the cream gene that caused Milkie's Palomino colour was carried hidden beneath those dark coats all the way from the golden buckskin Yellow Turk born 300 years earlier. Unless there was a different stallion altogether that sired Milkie, this is the only explanation for that Palomino colour suddenly emerging, but since the Jockey Club investigated thoroughly and concluded that there was no doubt about the accuracy of Milkie's pedigree, the Yellow Turk appears to be the source. Milkie was unraced, but became a renowned sire of excellent show hunters and began a line of buckskin, Palomino and cream horses that continues to this day. Like Milkie, Glitter Please seemed to appear out of nowhere, a bright, metallic Palomino with dark “Bend Or” spots foaled in 1982. Glitter Please was by the well-bred chestnut G2 winner Jack Sprat, a son of Prince John—Sweet Folly, by Tom Fool. The source of the cream gene was his dam, Lucky Two Bits, a buckskin by Valiance—Lucky Pamela, by Drawby. Lucky Pamela is thought to have been buckskin. The “bay” Drawby was the sire of another mare called Baby's Pal who produced the buckskin (or Palomino?) filly Pal O Mine, suggesting Drawby must have been buckskin. Drawby was by the multiple stakes winning chestnut, Diavolo. His dam was the bay stakes winner Drawbridge, by the famous bay Sir Gallahad out of a dark bay or brown named Traverse, out of the bay Perverse. And that is where the search grinds to a halt. Following through the pedigree, there are so many bays and browns in the pedigree of Drawby's dam that it is not possible to follow the line back to a known dilute. Looking at progeny doesn't help. Perhaps progeny with no colour listed are those that didn't fit the regular colour classifications, but without more data, there is no way to know the source of the cream gene past Drawby. Glitter Please competed in dressage for several years, but was hampered by recurring unsoundness in one hoof caused by founder, which limited his training and competing. However, he did win a trophy at the Prix St. George level (one step below Grand Prix, the top level) before being retired. When in his teens, Glitter Please was sold to a breeder specializing in coloured Sport Horses and sired sixteen buckskin, Palomino and cream offspring. The golden horse died in 2000 from severe enteritis, but he left a legacy of beautiful and athletic coloured Thoroughbreds. Very few of the modern dilute-coloured Thoroughbreds have raced. One that had a racing career planned was a 1998 colt called LooksPalominoToMe, a son of Glitter Please out of Gold Marquee (a granddaughter of Milkie), who was training at Fort Erie Racetrack in Ontario, Canada. However, he did not start and ended up gelded with no offspring. The Palomino stallion Milkie's Desire (1986 by Milkie) raced seven times and was unplaced, earning $112. He was used as a sire of show hunters. Although the dams of his registered offspring were well-bred mares from racing bloodlines, there is no indication that any of them raced. The Palomino filly Splash of Vanilla was the first-ever Thoroughbred identified as Palomino sold at Keeneland, going for $14,000 at age two in December 2008 as a racing prospect. She was by Ballado Chieftain and out of the unraced Guaranteed Gold mare Maid of Gold. She ended up unraced and was sold again at the Keeneland Mixed Sale as a broodmare in January 2011, bringing just $4,200. There are no progeny records listed for her yet. There could well have been other Palomino and buckskin Thoroughbreds, since they had to be registered as chestnut and bay. Breeders of dilute Thoroughbreds are still hoping that another line will emerge with the cream gene, but to date, Glitter Please and Milkie are the only known Thoroughbred lines remaining today that have the cream gene. Here are some books that you might like about dilute colours in horses. A simple yet thorough guide to horse color and equine color inheritance, featuring 185 color photos. Horse colors, genetics and probability crossing outcomes. Wow, great coverage of the light hued horses. 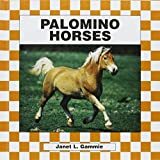 We had a Palomino growing up. Her name was Polly. She was a great, gentle horse.